David knew the importance of knowing the Word of God, to memorize Bible verses. The expression “in my heart” means that the psalmist knew many verses “by heart”, which is to say he committed it to memory. In Psalm 119:11, not only does the writer (David) give us an example to follow: “I have hidden Your Word in my heart…”; he also presents it as a great benefit: “…that I might not sin against You”. God, who inspired David to write those words, is declaring that memorized Scripture helps keep us from sinning! Get into God’s Word, so He can get His Word into YOU! I Know You Can Read. Do You Have A Sound Mind? Then You Can Memorize Bible Verses! I go to where I have the Scriptures I want to memorize. I read through them, out loud, once every day. That’s The “WHAT”; Here’s The “HOW”! Seven Steps: How To Memorize Bible Verses! Decide TODAY that you WILL begin to memorize Bible verses. You know that the benefits are amazing beyond words. If you have read Why Learn Bible Verses you know that Scripture memory is something God definitely wants you to do. You also know that the devil is going to try to make you talk yourself out of it. You know it’s natural for you NOT to have a built-in hunger for Scripture memory at first. If your feelings are telling you anything contrary to these things that you know, you can be sure it’s because of the devil. Choose To Disregard Those Feelings! Choose instead to act in harmony with the truth that you know. Part of the process of forming a habit to memorize Bible verses daily is doing it at about the same time every day. I highly recommend that you make it your top priority by doing it the first thing in the morning. If that means going to bed a little earlier, DO IT! Getting into God’s Word first will align your thoughts with God’s thoughts and will set the trajectory for your whole day. You’ll be preaching the Gospel to yourself, which you need every day. It acts as an inoculation against the poisoning messages of the world around you. Therefore, choose to tune your instrument BEFORE each day’s performance. We learn from science that an iron needle will become magnetized if you rub it over a strong magnet. We also know from science that the needle will actually float on the surface of water. And because the magnetized needle is floating — and thus free to move — it turns until it points to the north. It acts like a compass. By “rubbing our minds” over the “strong magnet” of God’s Word, it causes us to turn toward God-honoring thoughts and choices, just as the iron needle turns toward the north. The needle looses its magnetic strength during the day. Likewise, we tend to become weakened and beaten down by the tough issues of life that confront us each day. I choose to “rub my mind” over the “strong magnet” of God’s Word at the beginning of each day, so that the “iron needle” of my life will be at full strength (and thus point me toward Godly decisions) BEFORE the issues of the day hit me like a “pie in the face”. Another compelling reason to get up early is because that’s what the people described in the Bible did. The fact that God caused the writers of Scripture to include that detail means it’s significant to Him. I have decided that I want to be in harmony with God’s Word in as many ways that I can find. They got up early, therefore I get up early. I know myself well enough to know that if I try to “fit it in” during the day, it’s very likely that I won’t get to it at all. Here are examples I found. If rising early to do His will was so important to God that He caused the various writers of Scripture to make mention of it, isn’t that a pattern intended for us to follow? Speaking personally, I want to be in harmony with Gods ways in as many areas of life as I can. Besides: I know myself well enough to know that if I were to try to “get around to it” later in the day, I often would not get to it at all. This is very much a personal choice. You’ll want to memorize Bible verses or short passages of Scripture that speak to a need or a problem in your life. Get a pack of 3 x 5 cards, and write them out on the cards. 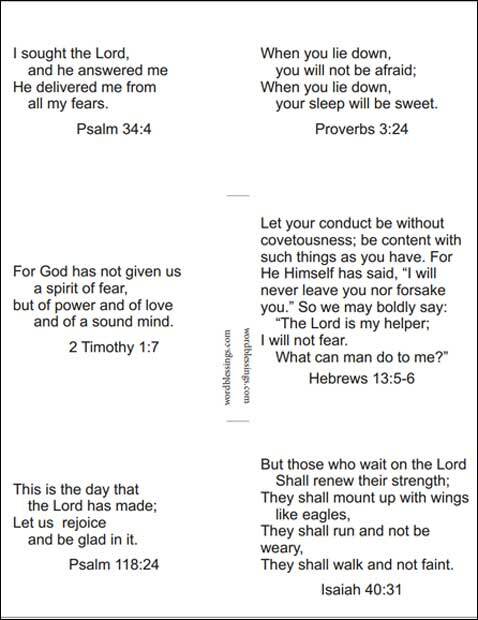 Or, if you like, download and print out the pages of Scriptures I’ve provided here for you. If at all possible, read your verses out loud. Doing this seems to aid the memory process, as you are both seeing and hearing the verses you read. The process I’m advocating is to read as many verses as you want to memorize, once each day. Obviously, it will take more calendar time to get them all memorized. You won’t be able to recite them all by next Thursday. But I think you’ll find, as I did, that doing this is a great way to memorize Bible verses, and allows you to almost effortlessly learn as much Scripture as you want. As you read your Scriptures, be sure to include the book, chapter, and verse. After all, you’ll want to be able to state where the verse you’re quoting came from so you can share it with others, right? I’ve noticed that it seems to be easier to remember the actual verse than to remember the book/chapter/verse reference information. I’ve heard others say that, too. Here’s something that will help you really take hold of the Bible. For each Scripture, find it in your Bible and underline it. Study the context — what comes before the passage, and what comes right after it. Does it contain a lesson for you to know? Take hold of it, and let it correct your course through life. Does the passage illustrate a sin to avoid? Take note. Is there a principle to live by? State it in your own words. Does the passage call you to praise God? Praise Him. Is there a promise from God? Believe it! Also — and this is an often-overlooked step — study the margin references at the edge of the pages of your Bible, and see if the verse your are studying is linked to other passages in the Bible. If so, turn to those passages and study them in the same way. You’ll be amazed at what you will learn. Even as the Holy Spirit inspired the writers of Scripture to pen their words, He knew that, thousands of years in the future, and in a language that did not as yet exist, the day would come when YOU would find that verse and be blessed by it. In 2001 God called me to write things like this, before “blogs” as we know them today even existed. So I urge you to find some way to share what you are learning with others. In the process, encourage others to memorize Bible verses also. In so doing, you will receive more than you give. You will realize that what you are doing is the work Jesus left for all of us to do. That’s why you and I are still here! I decided I wanted to memorize Bible verses first thing in the morning. So I have adopted the discipline of going to bed earlier than I used to — earlier than others in my family. I try to be in bed with the lights out by 9:30 in the evening. I find that I don’t need an alarm clock. Because I have already chosen to get up early, I have also asked God to wake me at the right time. I’m going on about this because I heard on one of the Bible lessons that there are about 3,900 Scripture passages in the Bible that call us to get God’s Word into our minds and hearts! Obviously, it’s one of His top priorities. There is absolutely nothing in the Bible that says IN WORDS that we have to do these things early in the morning. Having said that, there are numerous passages wherein people rose early for a particular purpose. Besides, I know myself well enough to know that if I don’t do it right away, I probably won’t get to it. For that same reason, I follow my time when I memorize Bible verses with a cardio workout on my exercise machine. Get it done early, before beginning the tasks of the day, seven days a week. Very few exceptions. I see this as giving to God the “first-fruits” of each day. Besides, I’ve noticed that nobody puts demands on my time early in the morning! Plus, when I memorize Bible verses in the morning, I’m literally putting God’s thoughts into my mind! This re-calibrates, renews, refreshes, and strengthens my whole being for the trials of the day in ways I could not have imagined! To be honest, I’m not a morning person either. My fleshly nature would very much rather stay in bed. For me it’s definitely a “mind-over-mattress” moment! When I found and understood the following words of Jesus, they astonished me! I recognized at once that these Words had just described what I was experiencing. You wouldn’t begin training to be a marathon runner by running 26 miles the first day. You would begin with a much shorter distance. In the same way, start your Scripture memory program with just a few minutes and a few verses. Similarly, you wouldn’t begin a weight-lifting regimen by trying to lift the heaviest weights. So then, don’t start to memorize Bible verses by spending hours. How much time you spend is not the issue. The goal here is to actually get started, then do it again the next day. Soon You will have developed a discipline — a habit — to memorize Bible verses at the same time and same place every day. 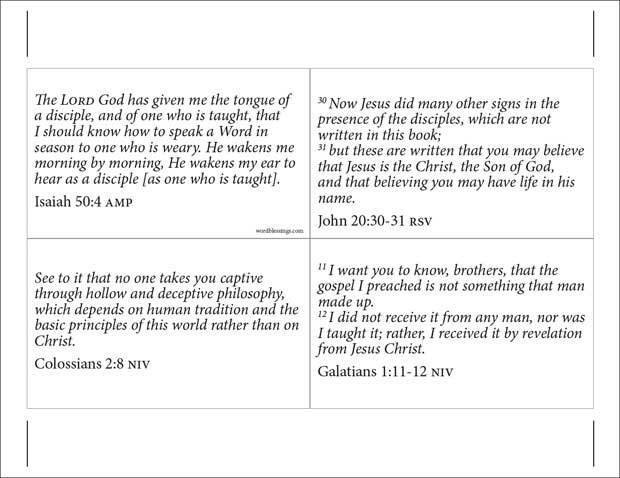 I realize that Scriptures printed on paper cards are very “old-school” in today’s world. When I can, I will put something together that you can download into your mobile device so you can read them wherever you are. Download the PDF file containing these pages. You can print them on standard 8-1/2 x 11 paper. Here’s an image of one of the pages in another PDF file that you can view, download, and print. There are seven pages, with 4 “cards” per page. If you can, print them on stiff paper such as 65# paper from an office supply store. I am so thankful for your message. I was going through a hard time but I have been lifted by the words of God. Thank you and may God bless you. Wyolene, thanks for your message! When I write a blog article, it’s like putting a note into a bottle and dropping it into the ocean. Will anyone find it? Will anyone actually read it? And if so, will someone feel moved to write a comment? It could be depressing except that I know that God is in charge, and He will direct one person here and another over there to write a note. I find this helpful but am 64 and having difficulty retaining or remembering what l read. Can you be of help? Elizabeth, don’t be discouraged just because it’s difficult. I find that to be true also. But I continue, even though I am almost 76. I read the same Scriptures over and over for a whole year. But I do a lot of them each morning. On weekend days I refresh / review the verses and chapters and books (Yes, I have memorized whole books of the Bible). It just takes time. I tell God that as long as He choose to leave me here, I will continue to put His Word into my mind. Those words are thoughts from the Mind of God. Thank you.When I was a kid we used to memorize bible texts for Sunday school.I wish I had taken it more seriously then.God bless and thank you. When I was growing up, we went to a church that did not promote learning the Bible at all. As a result, I have been “bionically illiterate” for most of my life. I was nearly 50 when I learned that the Bible was meant for ME and that there was great strength, comfort, power, correction, wisdom, and much more. So, I began doing Scripture memory on my own. This blog is the result of my determination to KNOW THE TRUTH. And as Jesus said (John 8:31-32) “…and the Truth will make you free”. I will be 76 in mid-September, but God has given me a way i can pour into others what He has poured into me. I’;m so glad you wrote! Truth be known, I’ve gotten much of my biblical training from Bible teachers and writers, do I think it’s fine for you to get ideas from this site. I hope to see your perspective on how to help others take hold of the Gospel. By the way… I’m 74, and I can’t wait to get up each morning and get to my computer. I want to encourage you to take Bible principles from here or anywhere and use whatever wisdom God has poured into you, and pour it out to others. sending the children or bible study or church,but you know I keep praying this will all come back. I truly believe believe God is going to build his church upon a rock. I ask God ,God they are building so many churches and so few are in them or they are leaving to find out wha that church has to offer. I ask God to have mercy on us cause it seems some of us still dont know what we do. Carol, I totally agree with you. This is helpful. I’m giving it a thumbs up! ?????? Will try this and see how it sticks over the next few months. Thank you for the tips. Yes scripture is key in resisting and defeating the devil. Yey! This is too helpful in validating my morning routines. I have attempted several times but It’s been too hard to be consistent. Really. But because of your writing. I am very much eager to start again. Christie, I’m so glad you found this article, and that you have decided to put God’s Word into your mind. And you realize, don’t you: the verses you choose began as thoughts in the Mind of God in eternity past! These are things God waned every person to know. And you’re getting it! You are about to be sooooo blessed! Now, don’t let the devil talk you out of it. He will try very hard to keep you from internalizing God’s Word. Thanks for your kind words. Your comments are a real encouragement to me. I just want to encourage you again, that the ministry the Lord has given you has greatly encouraged me and many others!! I know this doesn’t come cheap. Great will be your reward. You are right about the price. Lots of time in God’s “university of adversity”! In the process of going through a break up? What’s good scripture to read? I was never really big on religion. I was more of the conspiracy type person, but for some reason every time I read anything to do with Jesus or God I always get this feeling that generates inside of me. I just can’t explain it. The fallen one continues to try and stop me from reading scripture and I will be honest he has won a few battles. Yet, I still always find myself crawling right back wanting to feed my spirit with the true food for us. I just wanted to leave a quick comment because what you have done here is amazing. Even if its just one person you push towards the light, that is a remarkable feeling. Thank you for the help and guidance. I really want to do this. So keep me in your prayers and encourage me when you can. I am going to give it a try. It will help me in my prayer time and delivering the word to people. Thank you for your post. I was asked to teach an Adult Sunday School Class last April. I had never taught adults before but felt the call on my life. It is only by the Grace of God that I can do this. I will be sharing this with the class. It is absolutely necessary to know the Word of God to survive in this world we are traveling through. We must know and retain and then practice His Holy Word, not just for our self but to share with others. How right you are, Sherrey, about the need for the Word of God for survival.